Toyota Motor's U.S. sales rose 87 percent to 202,973 in May from a year earlier, and the Japanese automaker has now gained market share for the year. DETROIT -- U.S. light vehicle sales -- helped by a surge at Toyota Motor Corp. and Honda Motor Co., and more healthy gains at Chrysler Group -- climbed 26 percent to 1.33 million last month compared with a weak May 2011. The seasonally adjusted sales rate hit 13.8 million, the lowest pace of 2012. While the pace of sales came in below expectations, it was well above the 11.7 million rate of May 2011, the year's second-weakest month, and higher than during any month last year. The U.S. auto industry, aided by rising incentives, fleet shipments and consumers that continue to shrug off job and financial anxieties, remains on a stable track for its best showing since 2007, when sales totaled 16.15 million. U.S. light-vehicle demand has now advanced 13 percent so far this year to nearly 6 million units. "In spite of a tremendous amount of global economic uncertainty, the U.S. vehicle sales industry continues to power ahead," Reid Bigland, the head of Chrysler's U.S. sales operations, said in a statement. Toyota Motor Corp.'s sales rose 87 percent from a year earlier, when Japanese automakers began to suffer from a shortage of vehicles following a March 2011 earthquake in Japan. 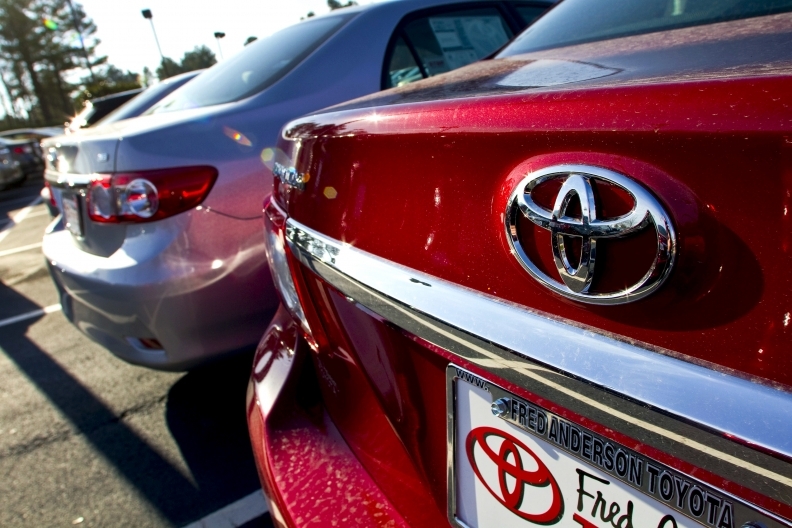 Sales at the Toyota division nearly doubled to 175,463. American Honda's U.S. sales jumped 48 percent to 133,997 in May. The automaker said deliveries at the Honda division advanced 46 percent to 119,411 and Acura volume rose 62 percent to 14,586. "Honda's return to strength is in full swing," John Mendel, head of American Honda's U.S. sales operations, said in a statement. "Any time Honda Civic sales surpass 33,000 units in a month, it shows real demand in the marketplace." Chrysler Group posted a 30 percent increase in sales last month while General Motors and Ford rebounded from April declines. Nissan Motor Co.'s May sales rose 21 percent for their biggest gain of the year. The Volkswagen brand advanced 28 percent. At Hyundai, sales rose 13 percent to 67,019. After a 5 percent decline in April, GM's sales rose 11 percent last month, with deliveries up 10 percent at Chevrolet, 19 percent at GMC and 19 percent at Buick. Cadillac's slump continued with sales off 15 percent. At Ford, sales rose 13 percent, with deliveries at the Ford division advancing 13 percent and offsetting a 2 percent drop at Lincoln. Ford sales had been down 5 percent in April. Chrysler brand sales surged 81 percent, while Jeep sales rose 24 percent and Ram truck demand jumped 23 percent. Fiat 500 deliveries more than doubled to 4,003, and sales of the Chrysler 200 mid-sized sedan rose 87 percent to 13,250. It was the 26th consecutive month Chrysler's sales have advanced, and the 12th straight month the gain has been 20 percent or more. Chrysler's U.S. sales have increased 33 percent this year to 689,257 units. The automaker has been aided by a revamped large and mid-sized car lineup, a redesigned Jeep Grand Cherokee SUV, as well as fleet orders and some of the industry's highest retail discounts. Chrysler also offered a sales promotion late last month that delayed the start of payments for 90 days on certain models. "The Japanese competitors are now back fully in the marketplace," Chrysler CEO Sergio Marchionne told reporters on May 24. "It's something that we have not had to deal with, effectively, over the last 12 months." Industry sales started strong early in May, softened during the middle of the month "and then came back again over the Memorial weekend," Jonathan Browning, CEO of Volkswagen Group of America, said this week. Light vehicle demand -- a bright spot in the U.S. economy -- had climbed 10 percent this year through April and the annualized sales pace had topped 14 million units each month until May. "Pent-up demand continues to fuel auto sales at a steady and sustainable level," said Jesse Toprak, head of market intelligence at TrueCar.com. Easing credit conditions, fleet deliveries and a steady but sometimes choppy rebound in the U.S. economy are also driving industry sales. GM's closely watched retail sales -- roughly 70 percent of overall deliveries -- rose 14 percent while fleet sales inched up 3 percent last month, the automaker said. Analysts say automakers have also caught a break with the recent drop in gasoline prices nationwide. Sales of big pickups surged last month, with the Chevrolet Silverado rising 22 percent, GMC Sierra volume up 23 percent, Ford F series sales up 29 percent, Dodge Ram deliveries climbing 29 percent and the Nissan Titan rising 86 percent. The rise in sales is prompting automakers to boost output by adding overtime and production shifts. Ford said today it will increase third-quarter production across North America by 5 percent to 690,000 units. Bigland said Chrysler was also "in the process of adding production capacity as quickly as possible to meet strong demand." Among the biggest automakers, GM, Ford, Honda and Nissan have lost market share this year, while Chrysler, Toyota, and the Hyundai-Kia Group have gained ground. Some automakers were forced to hike incentives to coax buyers into showrooms last month. Suzuki, after posting a 17 percent drop in April sales, introduced 0 percent financing on 72-month loans across its U.S. lineup. Its sales rose 3 percent last month. Ford said it raised incentives in May after falling short of sales targets in April. "Incentives are expected to play a larger role in May than in the past few months when pent-up demand drove consumers back to the market," Jeffries analyst Peter Nesvold said in a research report on Thursday. GM offered "substantial" increases in rebates for pickups and SUVs, while Ford boosted discounts on models such as the Fiesta and Focus cars, Escape crossover and F-series pickups, Nesvold said. Edmunds estimates automakers spent an average of $2,135 on incentives per vehicle in May, up 3.9 percent from April, and up 0.6 percent compared with May 2011. TrueCar.com said average incentive spending per new vehicle totaled $2,392 last month, an increase of 4 percent from May 2011 but a drop of 2 percent from April 2012.